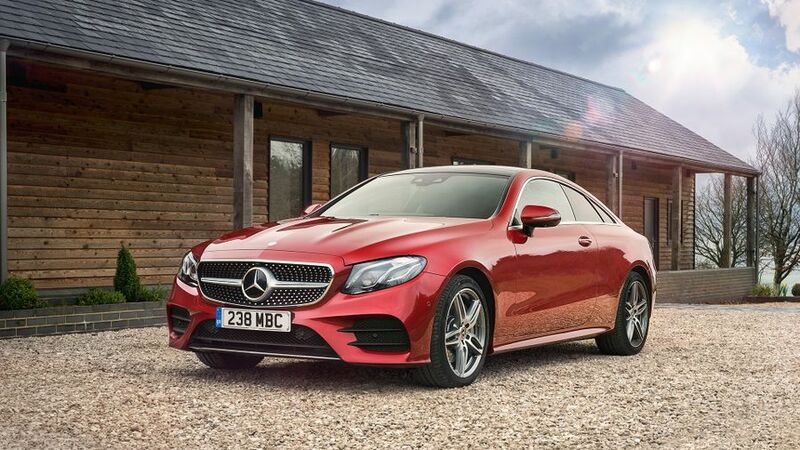 The E-Class Coupe takes the essence of Mercedes’ mid-size saloon, ditches two doors and creates a coupe with more of a smooth and stylish look. It targets the likes of BMW’s 6 Series but at a lower price; one that puts it close to Audi’s smaller A5. The Mercedes-Benz E-Class Coupe is a stylish and well-equipped coupe that nails both comfort and quality. If you’re expecting a sporty experience from this coupe, you might be disappointed, but as a luxury cruiser, it’s fabulous. Compared with other coupes, it’s impressively practical in terms of rear seat and boot space, and it’s considerably cheaper than a BMW 6 Series. 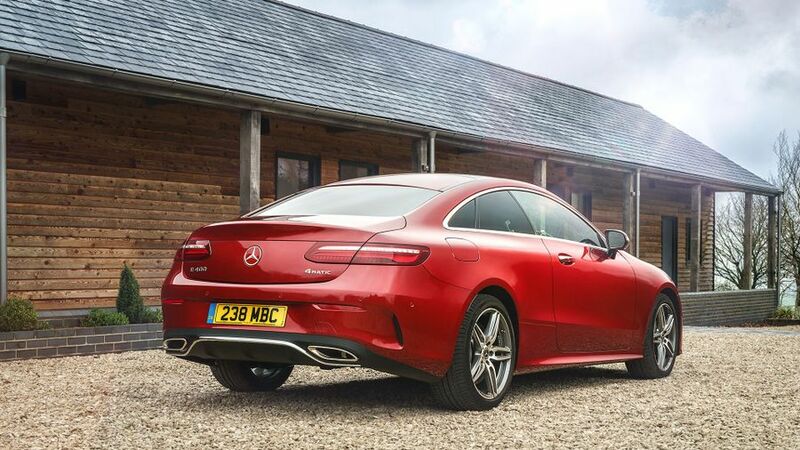 From the bonnet to the doors, the E-Class Coupe is virtually identical to the E-Class saloon, but towards the back it has a smooth and shapely silhouette and a sportier demeanour, aided by a suspension set up that’s 15mm lower than the saloon. All E-Class Coupes come in just a single trim – AMG Line – which means a generous specification, including 19-inch alloy wheels, some eye-catching LED headlights that include cool blue elements, and LED tail lights, too. The E300 also gets a sports exhaust as standard. Just as you’ll find in any other version of the latest E-Class, the Coupe has a level of interior quality that not many cars at any price can rival. The materials are dense, glossy and high-grade, with a wide range of textures and finishes to keep things interesting. And, combined with an exemplary standard of fit and finish, the feeling of sophistication is cranked up even further. As with most cars these days, most functions are controlled by scrolling through on-screen menus. 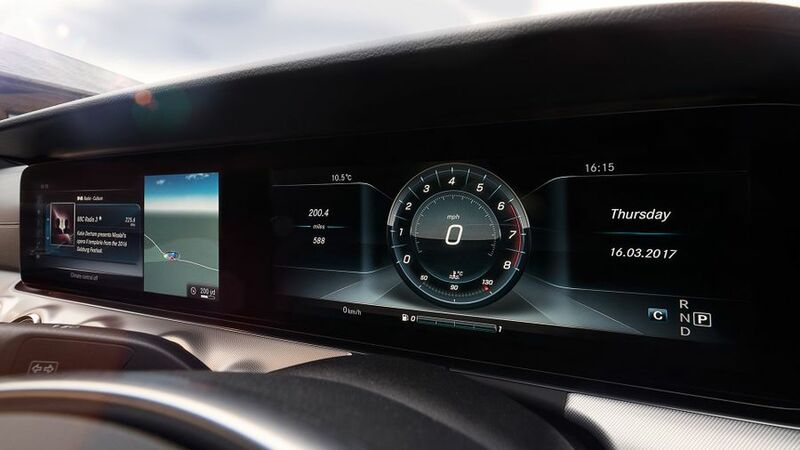 There are various ways of doing this in the E-Class (depending on how you specify your car), including touch-sensitive thumb pads on the steering wheel and another touchpad on the centre console. Neither is particularly easy to use, though, especially on the move, so you’re best off making do with the more conventional scrolling wheel and buttons, also located on the centre console. The electric seat adjustment makes finding your desired driving position easy. By its nature, a coupe will be less practical than a saloon, if only because it has fewer doors. But there’s a decent amount of space in the back for rear seat passengers, and longer trips shouldn’t be a problem, at least in terms of legroom. Taller occupants may find their hair getting messed up by the sloping roofline, though. This is, however, a strict four-seater; there’s no middle seat at all, just a pair of cupholders. Boot space is good for the segment; bigger than a BMW 6 Series and easily enough for one, and maybe two, sets of golf clubs. 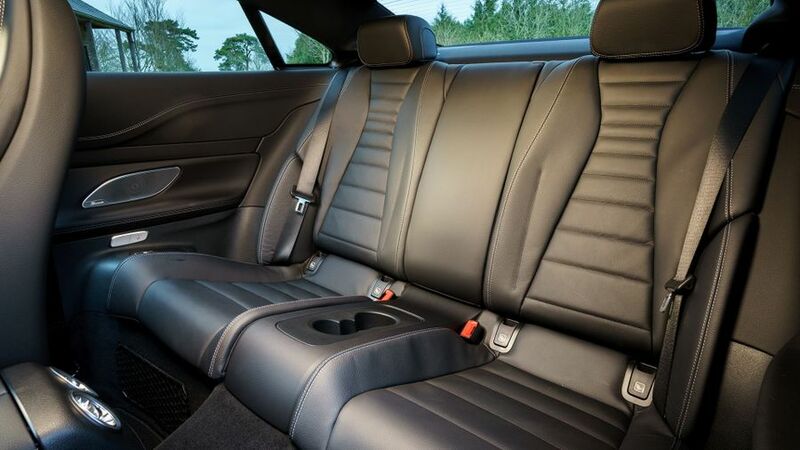 The rear seats fold in a 50:50 split to transport longer items; something that the 6 Series can’t offer at all. All the examples we’ve driven so far have been fitted with air suspension, which is standard on the most powerful versions and optional on the more modest ones. It allows you to vary the driving characteristics of your car according to which driving mode you select, but whichever, mode you choose the car stays impressively comfortable. On motorways and A-roads it wafts along beautifully, dispatching potholes and uneven surfaces with barely a ripple. It also allows the body to stay really well controlled in bends, so it changes direction in a clean, crisp manner. That said, if you have any expectations of sportiness from your coupe, then you might want to look elsewhere. The E-Class is too big and cumbersome to feel sporty, and it’s much better being used as a motorway cruiser than a back-road blaster. 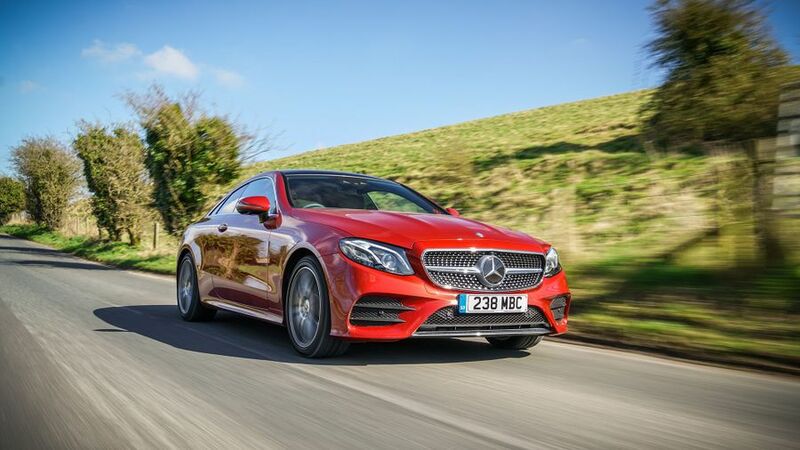 The E-Class Coupe is priced well below what Mercedes considers its main rival, the BMW 6 Series, which is a big attraction. It’s slightly more expensive than an Audi A5 Coupe, but then it’s also bigger, comes with an automatic gearbox as standard and is well equipped before you reach for the options list. The E220d’s low CO2 output of 106g/km make it attractive to company car drivers, putting it in a low benefit-in-kind tax bracket. Mercedes drivers can expect a more-expensive-than-average time at the dealer for servicing, but on the other hand, residual values are likely to be strong. The latest generation E-Class is too new for detailed reliability data, but its predecessor had a good reputation. However, Mercedes as a brand has fared less well, sitting near the bottom of the Warranty Direct Reliability Index. Any repairs or attention are likely to be on the pricey side, although Mercedes offers a three-year, unlimited mileage warranty for new cars, matching BMW and bettering Audi. Our fingers are crossed that the latest E-Class range, including the Coupe, goes towards restoring the company’s reputation. 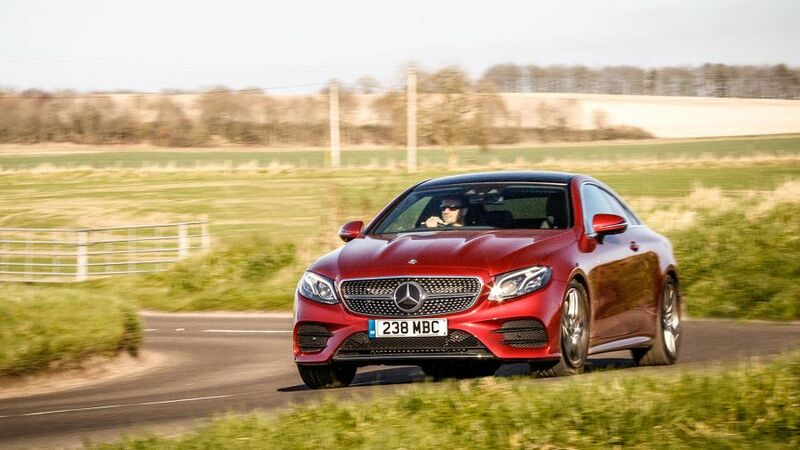 The E-Class Coupe hasn’t been crash tested by Euro NCAP, but the mechanically similar saloon version scored a maximum five stars and performed well in all areas. Similarly, the Coupe comes with an impressive level of standard safety equipment, including Active Safety Assist, which will warn the driver and apply the brakes automatically to avoid a collision with the car in front. Other standard systems include Attention Assist – which watches out for a sleepy driver – and Crosswind Assist, which helps vehicle stability when winds are high. Optional equipment includes a blind spot monitoring system and the clever Drive Pilot, which combines a speed limit monitoring system, adaptive cruise control and a steering assistance system to essentially drive the car automatically, staying in lane and keeping distance from other cars while adapting to changing speed limits. Of course, ultimate responsibility still rests with the driver, so don’t be tempted to hand over the reins entirely. 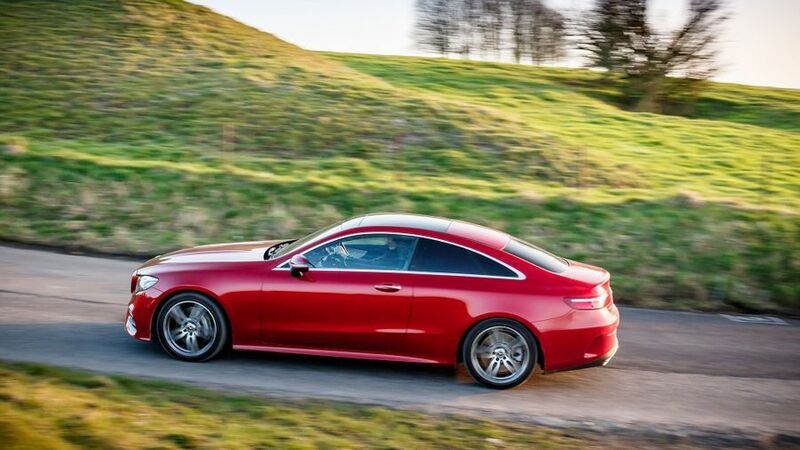 With the Coupe available only as the well-stocked AMG Line version, equipment levels are generous, although some of the cleverest kit is optional. Standard equipment includes an 8.4-inch infotainment screen, automatic parking and a reversing camera, as well as heated front seats and leather upholstery. You can upgrade to a bigger screen as part of the Comand Online package (standard in the E400), but we’re not convinced it’s worth the substantial cost. The Driving Assistance Pack, featuring Drive Pilot, adds some clever tech, but it’s expensive. However, we’d be tempted to order the Premium pack, which adds keyless entry and engine start, a memory package for the electric seats, and a panoramic glass sunroof that makes the cabin feel much roomier. Audiophiles may be further tempted by the Premium Plus pack, which includes an excellent Burmester sound system and some extra-clever headlights. 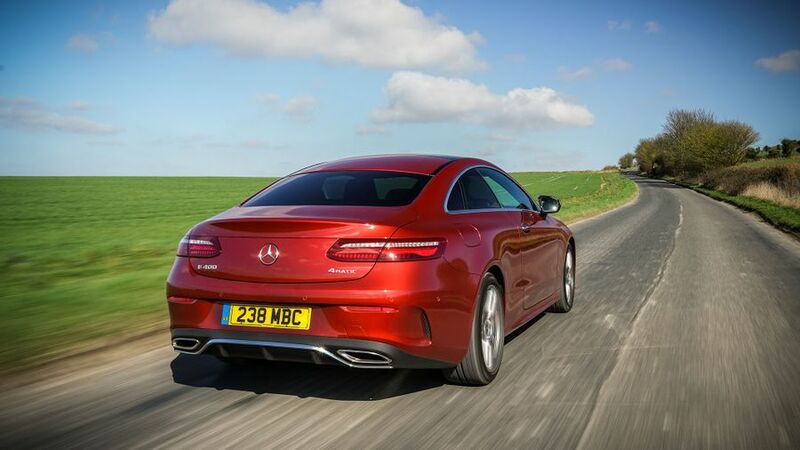 Although those additions aren’t cheap, the E-Class Coupe still compares very well to the cost of the BMW 6 Series even after the ticking of several options boxes. 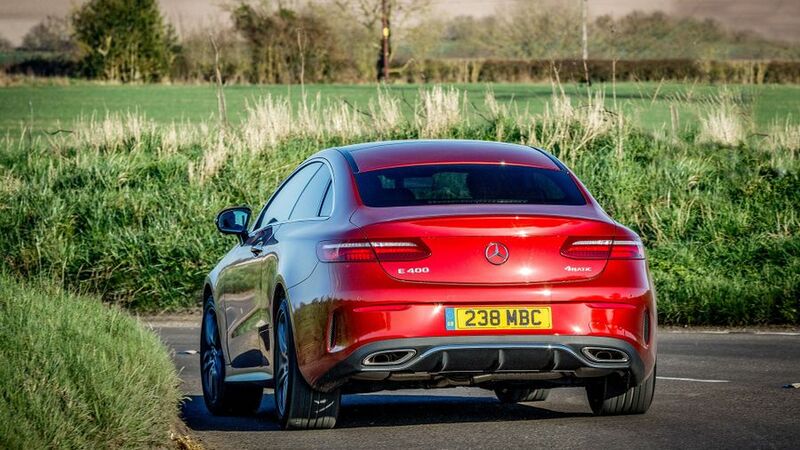 The E-Class Coupe sits somewhat on its own in the range of luxury coupes. If you want coupe style but need something bigger than an Audi A5, and don’t mind losing some sportiness, then this is right up your street. It offers a luxurious and refined cruise and will effortlessly munch up motorway miles at a price well below the equivalent BMW.